For the last two weeks SPEAR has been spotlighting our patients who are running this year’s ING NYC Marathon on November 3rd. Today’s installment features Vishal Desai, who sees Abby Karpinski, PT DPT at our 44th Street facility. Vishal’s story of triumph over cancer and paying it forward via the American Cancer Society’s DetermiNation team is truly inspiring and we are honored to have been able to help him prepare for his first NYC Marathon. Why do you run? My reasons are twofold. When I first started, I was looking for a way to get into better health, and for a way to give back to charity. I survived cancer when I was a teenager and I received assistance from the American Cancer Society. 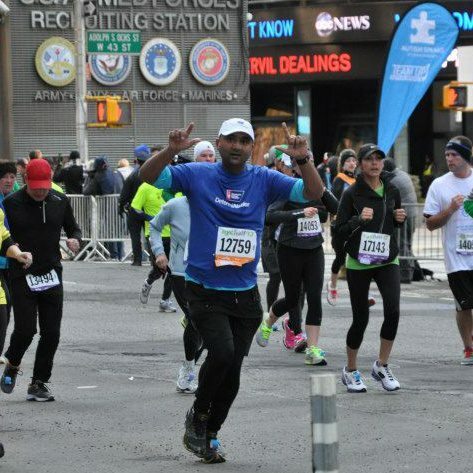 I figured I would try to run the NYC Half Marathon in 2012, and thought the perfect way to do it was by training and fundraising with the American Cancer Society’s DetermiNation team. I loved every minute of running with the team and I’ve been running ever since. I’ve been able to complete 7 half-marathons and 1 marathon. How long have you been running marathons? I did my first marathon in Philadelphia last year when the NYC Marathon was cancelled due to Superstorm Sandy, and thanks to Abby and SPEAR, I’m getting ready to finally run the NYC Marathon this coming weekend! Which physical therapist do you see at SPEAR and what treatments have you been doing for training? After having to stop training early in the summer due to shin splints and foot pain, I began seeing Abby Karpinski. I’ve learned quite a few strengthening, stretching and balance exercises. Abby helped me realize that I was pounding the ground and compounding my problems with my running style. After a few weeks of working together, and with a fair bit of ice, I was able to start running lighter, and reduce my pain. I was able to get back to training in September and now I’m ready to run my race! Do you have any words of wisdom or training tips for anyone thinking about doing their first marathon? The biggest thing is to take the race and training seriously. Stay disciplined, make sure you stretch and get time on your feet so you become mentally ready for 26.2. And if you can, try to find a team to run with. Nothing to keep you going like a little peer pressure.